The WARM-UP phase should begin on the pool deck. Some light stretching and stepping in place for 2-3 minutes is a good way to prep your body for a workout. Next, enter the pool and get on to your Aquabike. 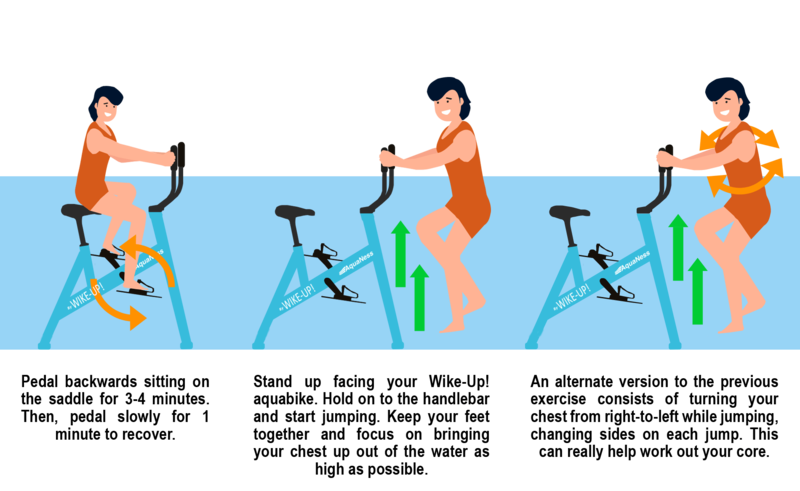 Spend 6-8 minutes pedaling at a slow & steady pace to get all of your muscles warmed up. Be sure to incorporate rotational head movements and arm movements to keep your upper body in the game. Keep these movements intentional and relaxed in the warm-up phase. Now that you are warmed up, it is time to start jumping into more measured exercises to get the most out of your WORKOUT. The next section details 6 exercises that you can alternate doing for a full-body workout. A good rule of thumb is to perform each exercise for 3-4 minutes, moving from an intense pace to a slower pace for 1 minute to recover from each exercise. Pedal for 5-to-10 minutes, progressively decreasing your pace in order to come back to a normal heart rate. Do this while simultaneously stretching the upper part of your body. Use a few moments at the end of the stretching phase to stretch your lower body on the pool deck. This is a great way to cool down after an great Wike-Up! 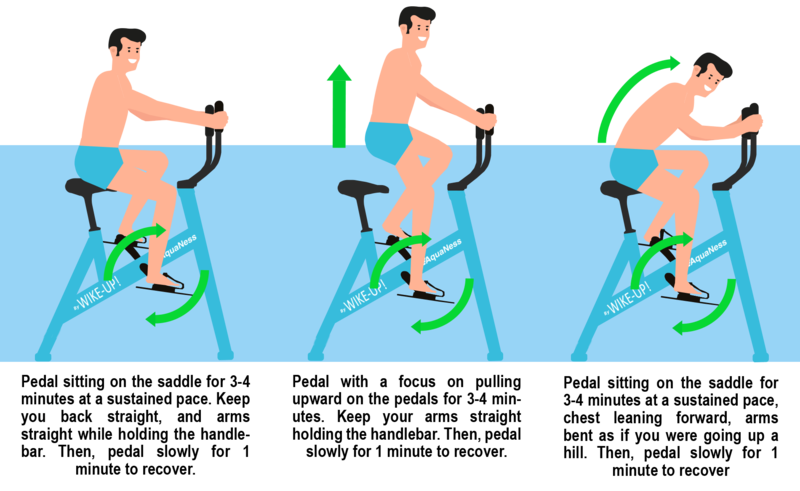 aquabike workout! All this exercises are very intense and require careful preparation to be completed correctly. With each session, you will see improvements in both your technique and your fitness level. It is all about practice and repetition. If during your session you feel tired or feel pain, do not force your training. Be sure to adjust session length and intensity as needed so you do not overexert yourself. Also you may have to adjust your aquabike, saddle and handlebar to fit your own personal needs. Happy Aquabiking!